Exclusive to the London Mint Office, this richly illustrated book tells the incredible story of the Falklands Conflict. Written by historian Justin Robinson, the book is packed with iconic, rare and never before published photos, and includes a foreward by Simon Weston CBE. That’s why Britain sent a Task Force racing 8,000 miles to the South Atlantic when the Falkland Islands were suddenly invaded by brutal military regime. For 74 days the fate of the men, women and children living on the islands dominated headlines around the world. After several weeks of intense fighting, and despite being outnumbered and outgunned, the British forces ultimately retook the islands and brought the occupation of its residents to an end. 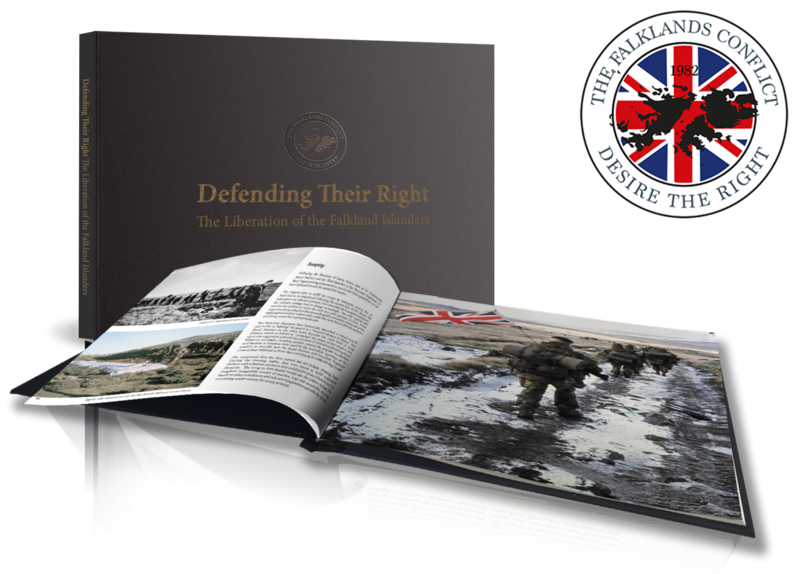 This year, to commemorate the 35th Anniversary of the Falklands Conflict we are very proud to offer a unique tribute to the heroes of the South Atlantic - a lavishly illustrated book; ‘Defending Their Right: The Liberation of the Falkland Islanders’. Exclusive to the London Mint Office, ‘Defending their Right’ tells the incredible story of the conflict and is packed with iconic, rare and previously unpublished photographs. The book also includes a foreword by Simon Weston CBE, who survived life-changing injuries on the Sir Galahad and has gone on to become a much loved celebrity, author and tireless charity campaigner.